Home Tags Posts tagged with "princess aurora"
Angelina Jolie’s daughter Vivienne was cast as the young Princess Aurora in her upcoming live action film Maleficent. And now two of Angelina Jolie’s six children – Pax and Zahara – will also make their big-screen debuts in the same movie. “They have smaller parts,” a source told Us Weekly, adding the 8-year-old boy and 7-year-old girl will not have speaking roles. The tomboyish 6-year-old did, however, have a role as her father Brad Pitt’s daughter in his film The Curious Case of Benjamin Button back in 2008. Angelina Jolie, 37, stars as the title role in Disney’s reimagining of the classic fairy tale Sleeping Beauty told from the evil doer’s point of view. The focus of the film centres on the events that hardened Maleficent’s heart, leading her to curse the Princess Aurora played by Elle Fanning. Back in August, The Sun reported that once 4-year-old Vivienne was cast as the younger version of 14-year-old Elle Fanning, the rest of the kids wanted to be included too. “Ange thought it would be a fun experience for her and Viv to share, and Viv is a natural,” said the source. 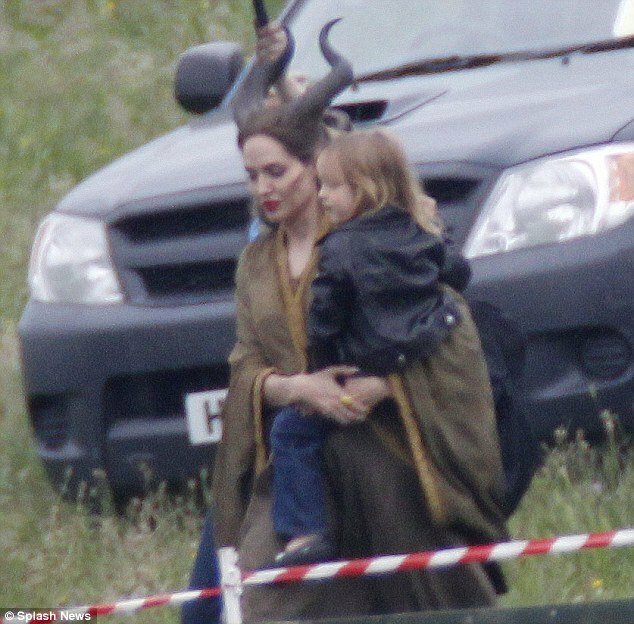 Both of the twins, Vivienne and Knox, were spotted visiting their famous mother on the set back in June and at one point Angelina Jolie held one of them in front of the soundstage’s green screen. The next day, Pax and Shiloh were seen walking around the Buckinghamshire set with a minder. Wearing her horned headdress, complete with prosthetic cheekbones and a long brown dress and matching cape, the dark-haired star looked frightening as the villain. Speaking about her new film Angelina Jolie told EW: “It’s not anti-princess, but it’s the first time they’re looking at this epic woman. She said: “It sounds really crazy to say that there will be something that’s good for young girls in this, because it sounds like you’re saying they should be a villain. [Maleficent] is actually a great person. But she’s not perfect. She’s far from perfect. Juno Temple, Sam Riley, and Miranda Richardson also appear in the film directed by Robert Stromberg, which is set for release on March 14, 2014. Meanwhile, according to the New York Daily News, the Jolie-Pitt clan has already gotten into the autumn spirit as recent aerial shots of the A-list couple’s Los Feliz home revealed a backyard table packed with Halloween pumpkins. Angelina Jolie and Brad Pitt, 48, also have an 11-year-old son named Maddox.